Think you can’t catch big fish without going on a boat? 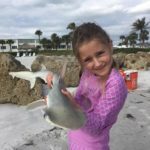 Beach fishing guide Steve Herich takes families or individuals out for fishing adventures on Siesta Key, Longboat Key and Lido Key. Steve is an expert fisherman and works with all levels of customers. Steve has a variety of packages available including a family special, Beach fishing apprenticeship and a Basic Package. Steve specializes in taking individuals and families out for a shore-based fishing adventure. Bring along some water and a snack, Steve will provide bait and tackle and give you a day on the beach to remember. Click on the link above to check out his website and get more information. 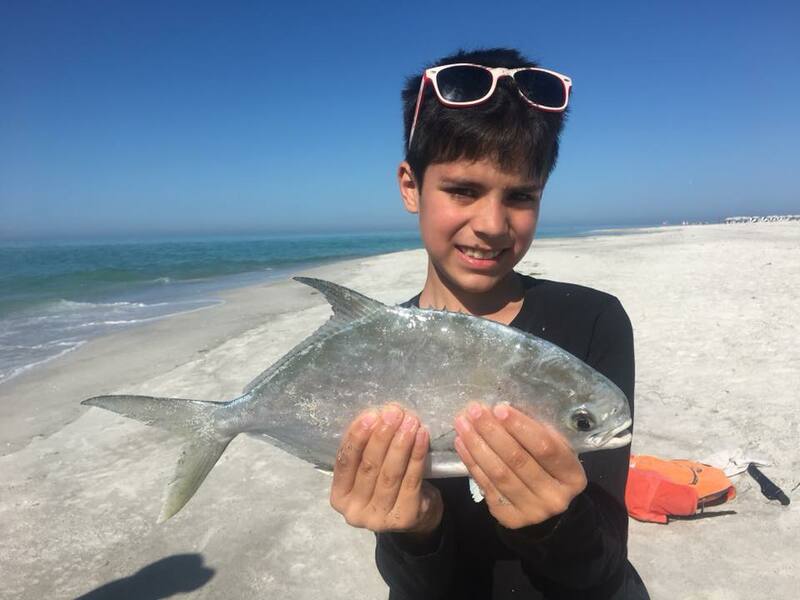 Beach fishing – a great way to spend a day on the Suncoast! In 2017, 19 dolphin in Sarasota area waters have given birth. If you are out by the Intracoastal or beach, be sure to keep your eyes peeled for the newborns. One of the mothers, “Ginger” is a bottle-nose dolphin that was rehabilitated at Mote Marine Labs dolphin and whale hospital. 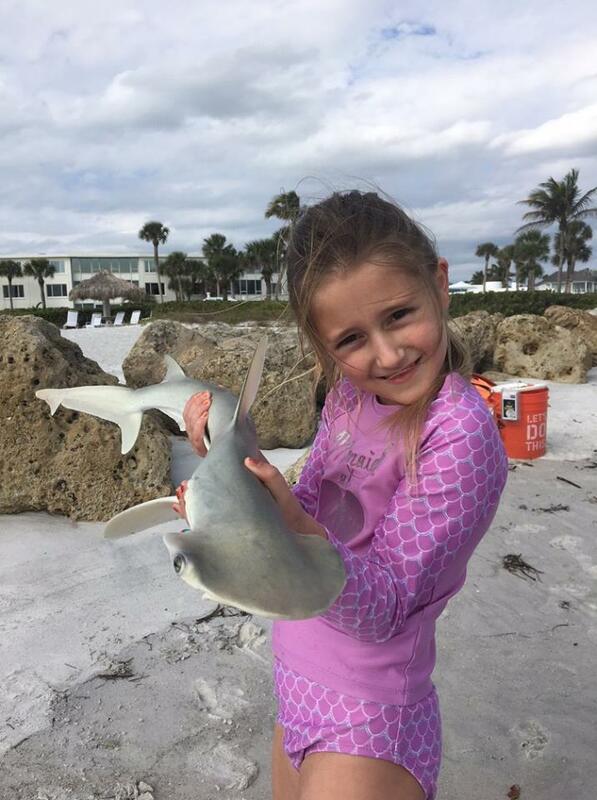 She was stranded when she was 3-years-old in December 2008 on Siesta Key Beach. Ginger was dehydrated and was covered in tooth-rake marks from other dolphins and appeared to be suffering from a respiratory condition called bronchopneumonia . She was released in February of 2009, with a VHF radio transmitter so Mote can keep tabs on her. 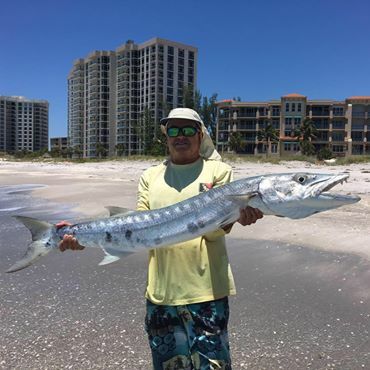 When visiting Siesta Key, where staying on the Intracoastal, Sarasota Bay or Gulf waters, be sure to keep your eyes open for the abundance of area wildlife! 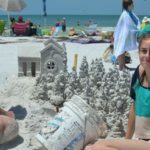 Sarasota County Parks, Recreation and Natural Resources’ Amateur Sand Sculpture Contest returns to award-winning Siesta Key Beach on Saturday, May 5, for the 46th year. 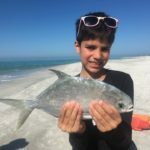 Friends of Sarasota County Parks and the Siesta Key Chamber of Commerce, are sponsoring cash prizes awarded to 1st, 2nd and 3rd place finishers in the adult (individual), adult (team), children (10 years old and younger) and youth (11-17 years old) categories and one overall people’s choice winner. Registration starts at 8:30 AM on May 5th on Siesta Key Beach near the yellow lifeguard stand. Each individual or group will be assigned a 10 foot by 10 foot square in which to sculpt their amazing creation. Bring your buckets and shovels and a plan to win! Spectators are invited to vote for the people’s choice award. Judging begins at 1:00 PM and the results are announced at 2:00 PM. April 20 & 21st head out for a finger-lickin’ good time at the 9th annual Suncoast BBQ & Bluegrass Bash in Venice, FL. This free annual festival features world-class BBQ, grammy nominated music, tons of family friendly activities and so much more. 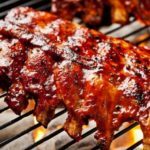 This event is a qualifier for The Jack Daniels World Championships, Food Network’s World Food Championships and The American Royal World Series of barbecuing. 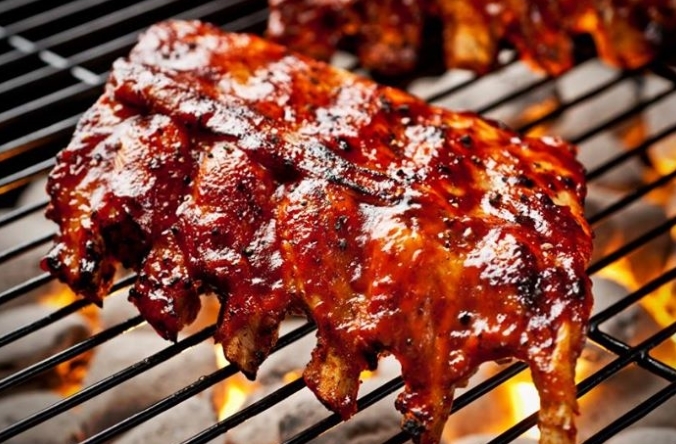 The nation’s top BBQ teams will compete for a $20,000 purse. Enjoy a variety of Craft Beers from Goose Island, Firefly Moonshine, Kentucky Gentleman Bourbon, Deep’ Eddy Vodka, Platinum Gin, Fireball, Blue Chair Rum and Margaritaville Gin. Friday, April 20 gates open 5pm, Saturday, April 21 gates open 10am. 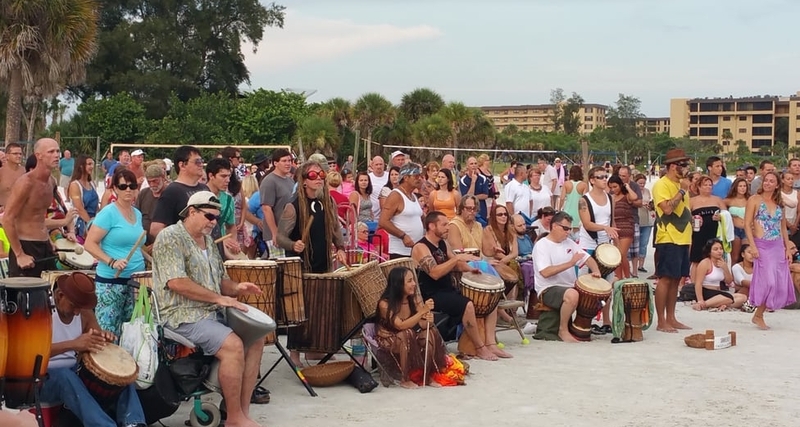 A must-do when staying in or near Siesta Key is a visit to the Siesta Key Drum Circle. 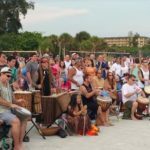 Head out to Siesta Key Public beach in the late afternoon every Sunday and you’ll first hear the primal beat of drums and then see a crowd gathering just south of the main pavilion between lifeguard stands 3 and 4 – the Siesta Key Drum Circle. It’s a diverse group of drummers, hula-hoopers, percussionists, rope walkers, sun-lovers dancers and people-watchers gathering to celebrate the sunset. This weekly celebration has been going on since 1996. Some come to participate, some just to gawk at the happenings. Drum circle regulars occasionally perform with swords and fire, you might even see a belly dancer. Everyone is welcome and encouraged to join in. Bring beach chairs or a beach blanket and get there early as the parking lot can fill up quickly. Drop by one Sunday evening for an amazing experience. Even after the the festive vibes have ended (typically around 10pm), you will head home with a reminder of the awesomeness that is Siesta Key. Need to identify the shells you find? Check out this site: Shell Museum. 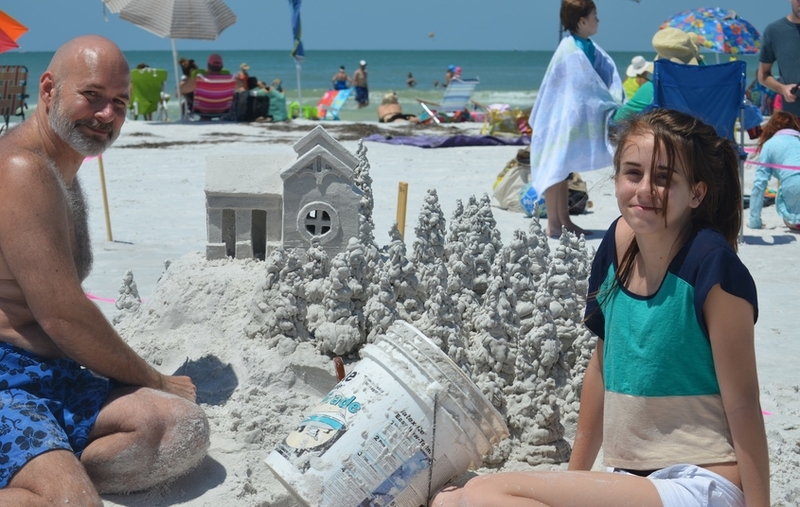 Siesta Key beach has awesome sand, but isn’t the best place around for shelling. There are plenty of coquinas though. 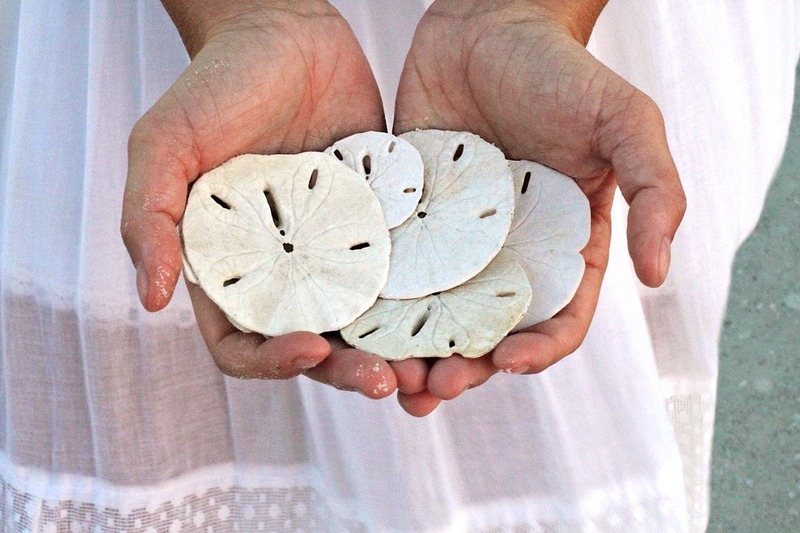 Head to the southern end of Siesta Key to Turtle beach for better shelling. If you kayak or walk south from Turtle beach you can get to the area known as Midnight Pass, which is a closed-in pass. Fewer visitors = more shells. You can find a variety of shells including crown, fighting, and horse conches, and banded tulips. Or, you can head north on Siesta to the public access on North Shell Road. 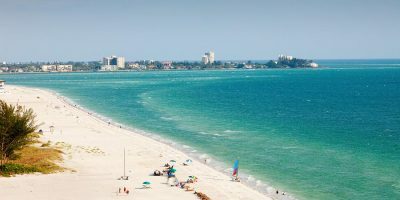 The beach at North Shell Road faces Lido Key and Big Pass. 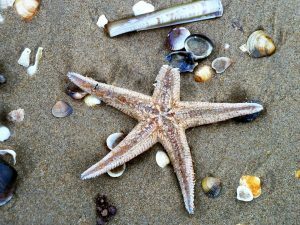 The sandbars there produce sand dollars, augers, lightning whelk, spiny jewel box, and olives at low tide. Watch for the currents though. On the only public beach, Whitney Beach, you can enjoy relative solitude by grabbing a patch of sand that feels miles from your nearest neighbor. Longboat has great shelling. 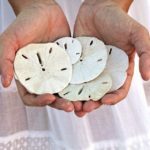 Sand dollars, spiny jewel box, augers, olives and lightning whelk can be found as well as others. You’ll find shore birds a-plenty including pipers, egret, pelican, heron, petrels, gulls, and skimmers. Keep you’re eyes peeled, because It’s not unusual to spot pods of dolphin fishing in the surf and sea turtle nests protected by tape and stakes along the shore. Coming up May 5 -6, 2018 is the 2nd Annual Venice Seafood & Music Festival in Centennial Park in downtown Venice. The festival is a weekend of mouth watering seafood creations prepared by top area restaurants including drinks and live music. Festivalgoers can surround themselves in the sounds of R&B, steel pan, jazz and Caribbean music while having their favorite beverage and eating some of the best seafood our are has to offer. The festival runs from Saturday 11am-8pm to Sunday 11am – 7pm. Admission is free. The festival’s seafood dishes are created using native and sustainable seafood from Florida’s coastal waters. Of course there are meat and vegetarian options and an assortment of side dishes and deserts.. They also offer a VIP Tent admission for $130 which includes a raw bar serving steamed snow crab, raw oysters, peel-and-eat shrimp and an open bar serving premium drinks. The private tent has dedicated servers and is located for optimal viewing of the live music performances. While there, be sure to enjoy the amazing shops and businesses in downtown Venice. Food Network just named Siesta Key’s own Toasted Mango Cafe among the best waffles in the country! The article refers to it as a “taste of true paradise”. Toasted Mango Cafe features sweet and savory breakfast choices, huge portions, very reasonable prices, and fresh ingredients. cream, toasted coconut sprinkled on with side of mango butter! Of course, Toasted Mango Cafe features all the regular breakfast favorites – eggs, bacon, sausage, corned beef, pancakes, oatmeal, and on and on. With gluten free and vegetarian options, everyone will get their thrill on here! Toasted Mango Cafe is open daily from 7 am to 3 pm. It’s located just south of Stickney Point Rd in the Crescent Plaza. Competitive and recreational teams will be competing in the Sarasota International Dragon Boat Festival at Nathan Benderson park in Sarasota on April 21. 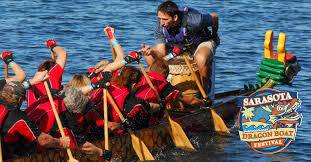 30 dragon boat teams will be competing in this one of a kind event. The dragon boat festival combines international culture, sport and community involvement in continuing a 2500 year old tradition of ancient China into the fun and excitement of a Sarasota festival. The crew of a dragon boat is 22, made up of 20 paddlers in pairs facing toward the bow of the boat, 1 drummer or caller at the bow facing toward the paddlers, and 1 sweep standing at the rear of the boat to steer. Admission is free; races begin at 8:45 am and continue throughout the afternoon. The festival grounds have a lot to offer – a bustling Vendor Village, Food Truck Bazaar, interactive Kids Zone, Beer Garden, and a Mini Asian Festival presented by Asia Trend Magazine, featuring a nine-piece dragon dance, lion dance, Chinese Calligraphy give-away and Japanese Calligraphy give-away. Spectators can take in all the action and watch the excitement of racing and learn about the sport of dragon boat. Another highlight is the Health and Wellness Village, visitors can receive products and services to help maintain a healthy lifestyle. Families are invited to bring their children to come spend time at the races and enjoy an amazing Sarasota festival. Mini Asian Festival featuring a nine-piece dragon dance, lion dance, Chinese Calligraphy give-away and Japanese Calligraphy give-away.